One stop shop destination for premium Chinese ingredients, delivered to your door. Since I started blogging, I’ve gotten hundreds of emails and comments from my readers mentioning how difficult it is to source Chinese spices and ingredients. For any of you who do not live in a metropolitan city like New York or LA, it might be challenging to find a good Asian market. Most of the time it either requires a long driving time. Or there is just none in the neighborhood. I totally get that. Because I face exactly the same problem living in Austin. That’s why after moving to the US from Beijing, I started to create recipes like Bacon Chow Mein and Jambalaya Fried Rice. They might not be super authentic but at least you can easily get most of the ingredients in normal grocery stores. On the other hand, there are certain ingredients that are irreplaceable, for example, Chinkiang vinegar and Sichuan peppercorns. When you’re skipping ingredients like these, your dishes will just taste like a box of takeout from a random American Chinese chain. Yes they might taste just as OK, but nothing spectacular. Of course, they do not at all resemble the dishes I ate growing up in China. There are so many times I thought about opening an online store to help my readers get authentic Chinese ingredients. But I have neither the expertise nor the extra energy. A few weeks back when I received an email from Taylor telling me about her new online premium Chinese spice store, I was so excited that I jumped from my chair and almost knocked my giant cup of hot tea onto my keyboard. 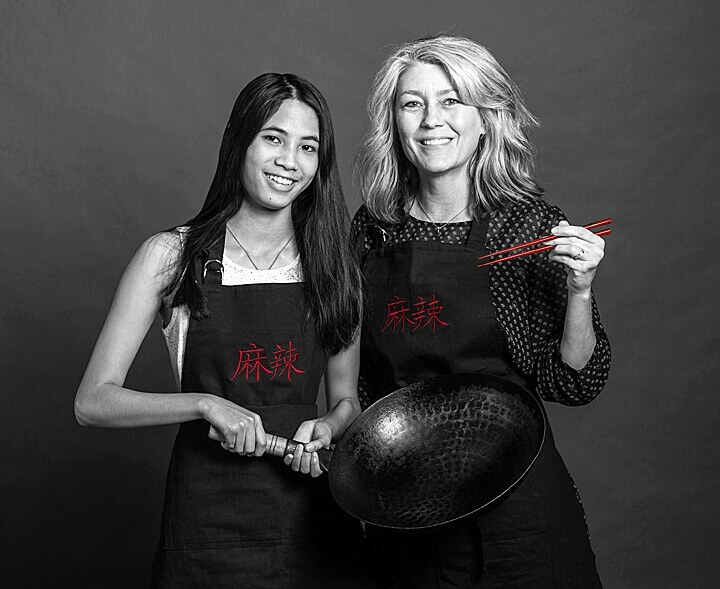 Just a quick recap: Taylor is the lady who runs The Mala Project, a food blog in which she shares authentic Sichuan recipes and her stories of raising an adopted Chinese daughter in the US. Meet Taylor and Fong Chong! Taylor is a veteran journalist and writer who previously worked for the New York Times and Wall Street Journal before diving into the world of blogging. Her daughter Fong Chong is the professional taste tester, who makes sure all her Chinese dishes are properly prepared. They work as a team to bring real Chinese food to the US. Their recipes are crafted with the detailed instructions for non-Chinese readers using ingredients sourced from Sichuan, keeping the dishes as authentic as possible. After exchanging several long emails, we finally met in person in Birmingham a few days ago. Chatting with glasses of bourbon in hand until midnight, we were like two old friends who hadn’t met for 20 years. The magical power of food is amazing isn’t it? Growing up as a single child in Beijing and now living in a foreign land, I suddenly feel like I have a big sister with whom I can chat about anything. It finally felt like I was home again. Dinner with Taylor in Birmingham… this is where business gets done! 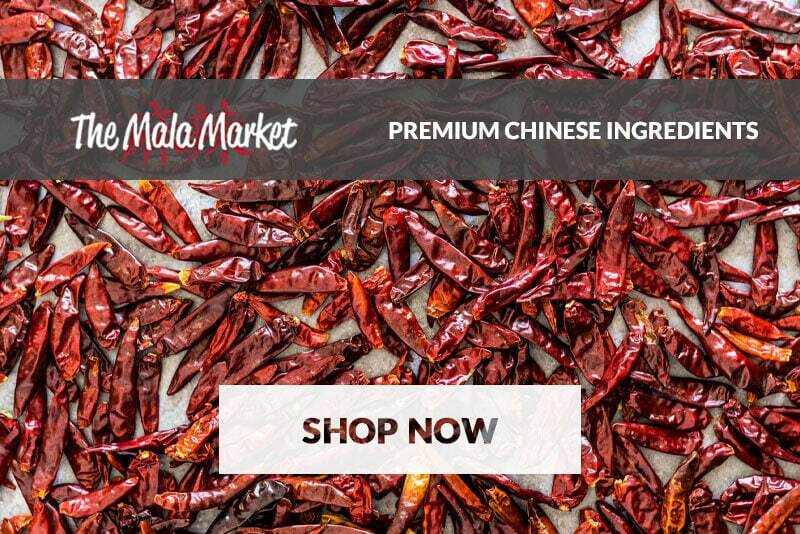 Today I’m happy to announce that I’ve officially become the affiliate partner of The Mala Market – an online Chinese grocery boutique store that sources and sells premium Chinese ingredients that are delivered to your door. Lao Gan Ma chili sauce – the most popular spicy sauce in China. The must-have Chinkiang vinegar, and premium Chinkiang vinegar aged for 6 years. Chinese sesame paste, a ingredient that is similar to tahini, has a rounder and richer nutty flavor, and arguably tastes better than peanut butter! Chinese pickles – a secret ingredient that takes your instant noodles to new heights. The answer is – Sichuan peppercorns. Taylor once wrote a detailed post on sourcing Sichuan peppercorns (read it if you haven’t already). The problem is, the Sichuan peppercorns in most Asian grocery stores in the US are stale and have lost their potency long ago. 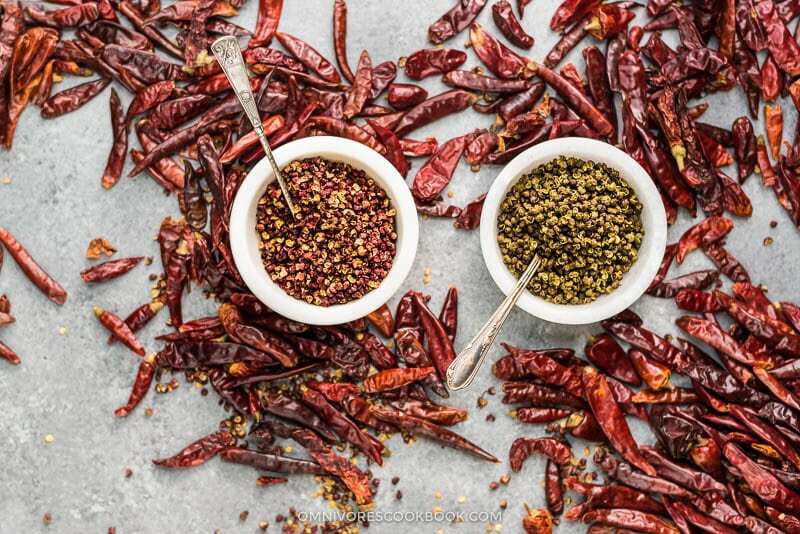 Why are Sichuan peppercorns important? 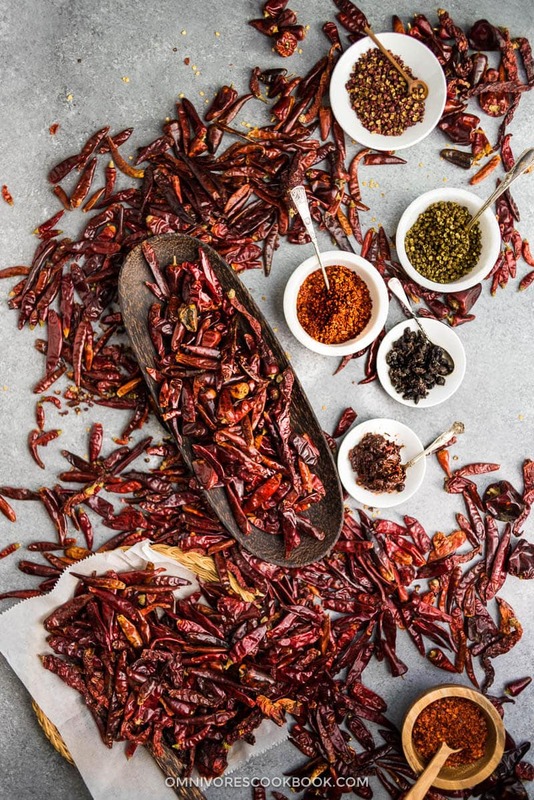 Not only are they the key ingredient to creating authentic Sichuan food, they are one of the most versatile ingredients in the kitchen that can transform any dish into a fiery phenomenon. 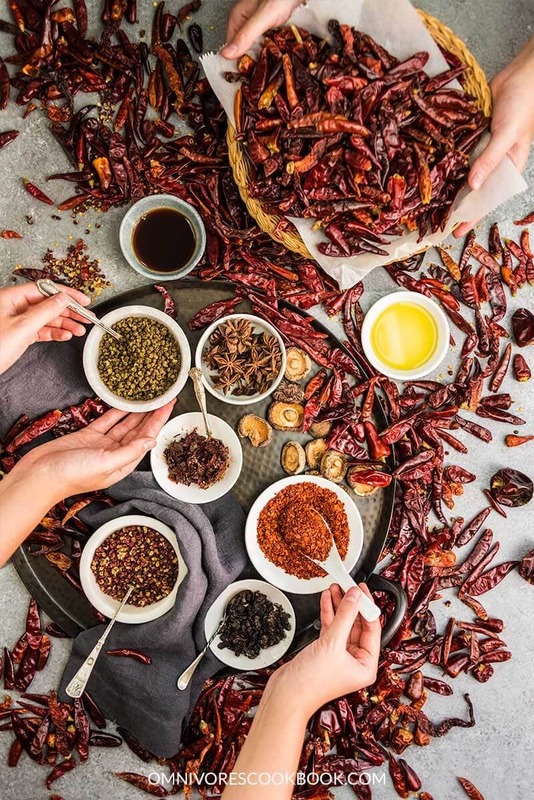 With Sichuan peppercorns on hand, you can cook some of the most authentic Sichuanese dishes, such as Chicken in Red Oil (Kou Zhui Ji), Kung Pao Chicken, Dan Dan Noodles, and Water Boiled Beef (Shui Zhu Niu Rou). You can also use them to infuse a smoky flavor into hot oil, and make super quick and flavorful vegetables dishes, such as 4-ingredient Fried Cabbage. Two years ago, when just by chance I chatted with Taylor on Twitter about this issue, I casually mentioned she should import them from Sichuan. In 2017 my peppercorn dream came true! I was dancing in the kitchen when the box of fresh Sichuan spices were delivered to my door. The bright red chili peppers and vibrant rose-colored peppercorns were just like those I had smuggled from China but were long since gone. They are super fresh, potent, and fragrant — ten times better than the products that most Asian markets offer. I was so excited and immediately cooked a big plate of Mala Chicken. I threw in 3 cups of dried chili peppers, just the way we do in China. God, it was SO good! 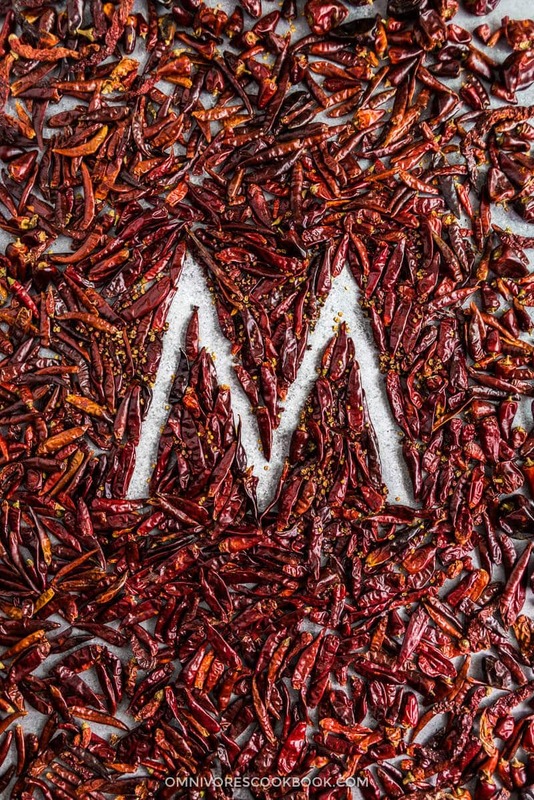 The quality of the Sichuan peppercorns speaks for itself and it became one of the key reasons that I decided to partner with The Mala Market. Now working as a team with Taylor, we’re trying to source the best Chinese ingredients and deliver them to your door at a minimal shipping cost. Not just an online store, we also aim to build it into an learning platform where you can access all the cool recipes and get to know how to use your newly purchased ingredients. For example, if you click on a product, you will see detailed information about it, how to store it, and links to recipes to teach you how to cook with it. We just launched the website and are still working on creating more tutorials and content everyday. But so far we’ve had many positive reviews from our lovely customers. “Your recommendations on Sichuan spices and especially the Laoganma condiments has changed my Chinese cooking for the better and I can’t imagine going back. My husband and I lived in China for four years and are Sichuanese addicts. I am so glad to see you are starting the online shop as it’s not always easy to find ingredients, even in New York City. Thank you so much for your amazing work!” — Christina M.
“I can find many of the ingredients I need in the stores around D.C. — but I often have to visit more than one to cross everything off my list. Your store is a wonderful addition to my online world!” — Joan K.
“I used a good handful of Bullet chilies in Gong Bao Chicken last night. I’m used to dried red chilies providing heat and flavor, but these also filled the room with a wonderful chili aroma. The freshness really makes a difference.” — Paul W.
Taylor and I are working on various exciting projects, which we’ll be announcing in the next few months. Just as a quick sneak peek, we’re working on creating Chinese and Sichuan pantry kits. 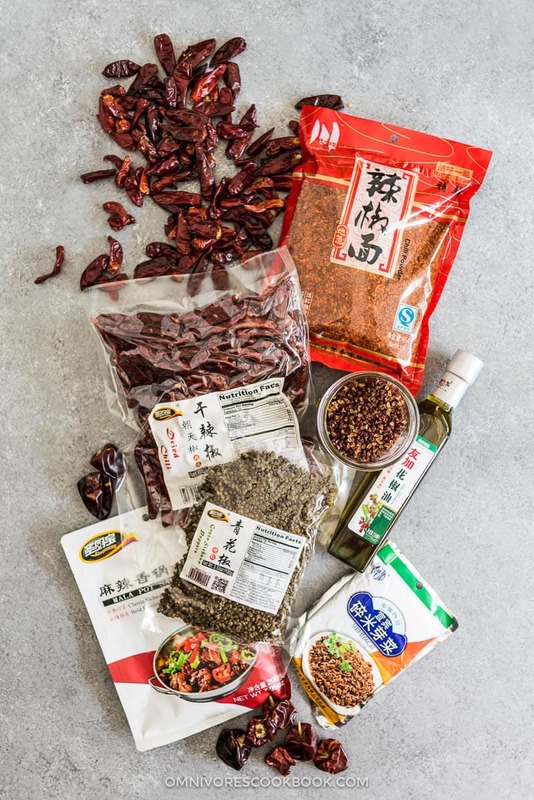 In these kits, there are hand-picked spices and ingredients that you need for building an authentic Chinese pantry. We will also create e-books that include the best recipes that teach you how to use your new spices to create authentic Chinese food in your own kitchen. Plus, once you place an order or sign up to the newsletter, you’ll become a part of the family where we answer your questions, share new cooking tips and behind-the-scenes secrets, and chat about our passion of Chinese food! Are you ready to join us and cook some genuine Chinese food? 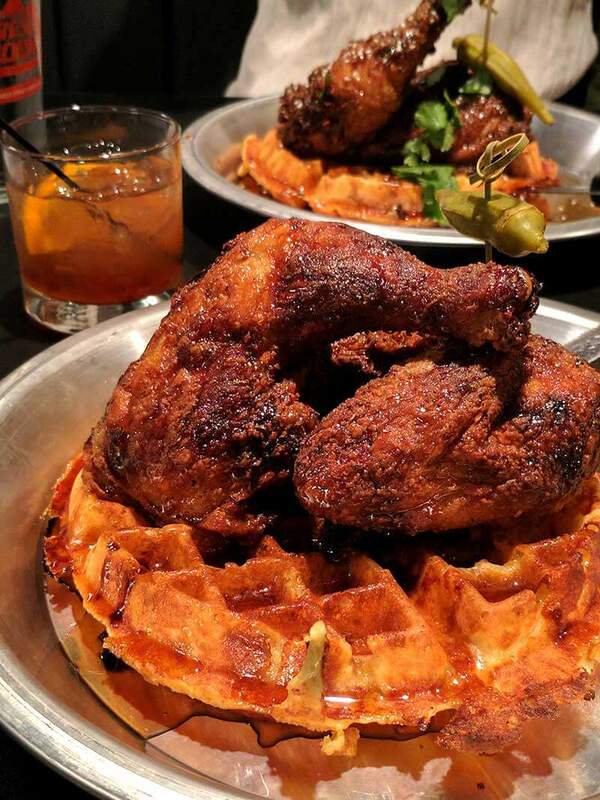 Start shopping now and let’s cook together! This is awesome, Maggie! If you ever need my help, please let me know! Beautiful photos! Best way to show the beauty of Chinese spices. I wonder if one day The Mala Market will have branches in Europe. Unfortunately I can’t find high-quality spices like that in the UK.